Chinese Farmers Revolt Against Government Land Grab Residents of a village in southern China are demanding democratic elections in a new standoff with authorities. The farmers of Shangpu say armed thugs sent by their own village chief attacked the community to pave the way for a new factory on their land. 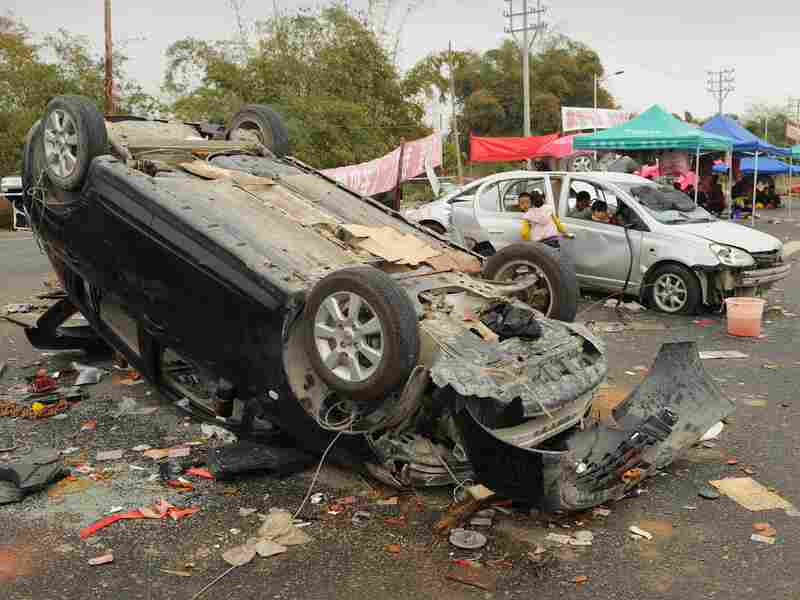 Smashed and overturned cars are shown Saturday after civil unrest in the village of Shangpu in China's southern Guangdong province. The road that runs along the edge of Shangpu village in south China is littered with the hulks of burned-out cars. Farmers have built tents and simple barricades made of rocks and wire. Police have set up their own cordon in a standoff that is approaching two weeks. This is the second uprising of its kind in Guangdong province in 15 months. The stalemate comes at an awkward time as China's rubber-stamp Parliament opened its annual meeting Tuesday in Beijing. Despite China's tremendous economic progress, the episode underscores the country's continued lack of rule of law and political accountability. Thugs Sent To Crush Opposition? Shangpu is a village of clustered, concrete houses surrounded by farm fields, banana groves and palm trees. Farmers still work by hand here, sometimes hoeing their fields at night while wearing headlamps. Villagers say the thugs arrived one afternoon late last month, wearing hard hats for their own protection. "When they got out of their cars, they used hoes to attack us," said Li, 60, who is nursing a broken knee from a brick he says a thug threw at him. "We acted in self-defense and threw rocks at them. Afterward, villagers came out and rang gongs to alert people." A cellphone video shows the villagers fighting back with bamboo poles from a construction site. A thug, whom villagers identified as a plainclothes police officer, fired warning shots. But the villagers easily outnumbered the thugs, chased them into a field, and then destroyed more than two dozen of their vehicles. Farmers say the thugs were sent to crush opposition before a groundbreaking for a new electric cable factory to be built on their fields. They say the village chief, Li Baoyu, sold off the land they were assigned by the government to a local developer. Under a secret contract villagers say they never signed, they were to receive about $1,000 an acre in compensation. But the villager, Li, says they don't want to leave the land. Without fields to grow their sweet potatoes, spinach and papaya, the villagers would have no livelihood. "We can only do some odd jobs making less than $10 a day just to get by," says Li, pouring rubbing alcohol on his knee, which is a swollen, purple mess. "This plot of land should be preserved forever for generations to come." The farmers say the village chief was appointed, not elected, and they are now negotiating with county officials. They want the thugs and officials who approved the project punished. "What we really hope to see is a legitimate village leader elected through a legitimate process," says another farmer surnamed Li. Local authorities have been somewhat responsive. Police have arrested the village head and eight of the suspected thugs, according to the Southern Daily newspaper. But villagers say land grabs like this are common and that the answer is more accountability. "This is our current problem in reforming the system in rural areas," says Li — there are many Lis in this village of 3,000. "If we had supervision, checking on the village committee, it would not have been able to secretly sell the land." Another problem is rural lawlessness and the tight relationship between business and government. For instance, the man who wants to build the factory is also a local Communist Party chief. As is often the case, the farmers blame local officials and are careful to voice support for the central government. Li, the one with the broken knee, even worries how this story might play. "If you publish this in America, will it tarnish the Communist Party's image?" he asks. Even if the farmers get elections, there is no guarantee it will solve their problems. The village of Wukan — about two hours away — elected its own leaders last year after a similar land grab. But the new officials were inexperienced and have struggled to govern. In a recent TV interview, Lin Zulian, the new village party secretary, talked about the difficulties of operating amid constant public criticism. "I'm afraid to answer the phone, afraid to see people," says Lin, appearing haggard and anxious. "If I tell the truth, it doesn't work. If I lie, it's even worse. Everything is hard to say." "The inner workings of government," Lin concludes, "are complicated."